As Enchanted Village's resident Wishcrafter, Darcy Merriweather has the power to make other people's wishes come true, but what she really wishes is that she had the power to uncloak the invisible man who's stalking her best friend. 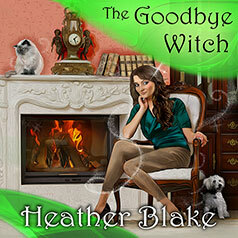 Darcy's closest friend and fellow witch, Starla Sullivan, hoped she'd never see her ex-husband, Kyle, again. Two years ago he tried to kill her, and he has been a fugitive ever since. Now Starla claims to have seen him back in Enchanted Village, but it seems she's the only one who can see him. To everyone else, her ex is invisible. Darcy only wishes his motives were as transparent as the rest of him. Since the police can't arrest someone they can't see, it's up to Darcy to find the secret behind Kyle's latest disappearing act—before he does something they can't see coming.